Canada Turns Left - Canada Immigration and Visa Information. Canadian Immigration Services and Free Online Evaluation. Canada’s election of a Liberal government, under Justin Trudeau, has big implications from the perspective in the United States. Of all the neoliberal parties during the Clinton-Blair 1990s, the Liberal Party of Canada qualified as the neo-liberalist. Under the double-headed leadership of Prime Minister Jean Chretien and Finance Minister Paul Martin, the Liberal government of 1993 cut federal spending to its lowest levels since the early 1950s. It sharply cut the top rate of corporate taxes, and hiked contributions to the federal pension plan. It reneged on a promise to repeal a consumption tax on goods and services introduced by its Conservative predecessor. Canada attained a balanced budget in 1998 and recovered its triple-A bond rating in 2002. That Liberal Party lost power in 2006 and in 2011, it finished third behind the socialist New Democratic Party (NDP). 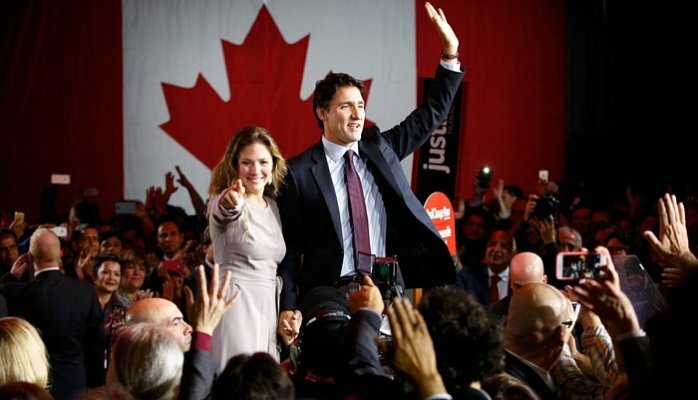 The party then turned to Justin Trudeau in 2013 to resurrect its fortunes. The young leader in turn made a desperate gamble of his own: to steer his centrist party hard left, mobilizing resentments and outflanking the NDP. Trudeau bears the most famous name in Canadian politics. His father, Pierre Trudeau, dominated Canadian politics from 1968 to 1984. Pierre Trudeau plunged Canada into ultra-statist experiments and massive debts. He resigned in 1984, just months before voters handed the Liberals its worst defeat in the party’s history up until that time. Meanwhile, Justin Trudeau has styled himself as approachable where his father was aloof. He was conspicuously absent from press briefings on his economic policy, explaining that he was vanishing from the campaign trail a month before election day to spend “quality time” with his family. Justin Trudeau has made it clear that the government he will lead will repudiate the legacy not only of the incumbent Conservative prime minister, Stephen Harper, but the neoliberal Liberals of the 1990s. Trudeau has committed himself to a policy of deliberate deficits, in the short term, to stimulate growth. His campaign focused on increasing taxes on wealthier Canadians to a new top rate above 50 percent while also vowing to cancel the Harper government’s controversial F-35 jet contract, insisting that Canada does not need such an advanced fighter plane. He pledged full legalization of marijuana and promised to increase Canada’s intake of Syrian refugees from 10,000 by next year to 25,000 annually effective immediately. In Trudeau’s most memorable speech that he gave in his pre-prime ministership, he characterized the demand of some Muslim women to cover their faces during Canadian citizenship ceremonies as the moral equivalent of the doomed voyage of German Jewish refugees on the St. Louis in 1939. The immediate aftermath of Trudeau’s success has been the downturn in the Canadian economy following the collapse of the price of oil and other commodities. Despite suffering comparatively less than other advanced economies from the made-in-USA financial crisis of 2008, Canada has suffered more than most from the sharp slowdown of the Chinese economy that began in 2014. Over the last 24 months the Canadian dollar has lost almost 20 percent of its value against the U.S. dollar and while that depreciation will in time stimulate Canadian exports, its immediate effect is to cut deep into purchasing power in a heavily trade-dependent economy. Trudeau’s overall strategy succeeded brilliantly with the Liberals winning at least 40 percent of the popular vote, their best performance since 1997. Pundits now raise the next question: can he deliver on his election promises and keep Canada on a strong path in the future?